Cook the pancetta either in a pan or in the oven until crisp, drain on paper towels and reserve. Season the salmon with salt and pepper and sear in a hot pan or grill until medium rare, about 4 minutes. 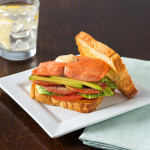 Meanwhile toast the bread to golden brown and slice the tomatoes into ¼ inch. Separate the little gem Romaine into individual leaves and wash if needed. Spread the mayonnaise equally onto the toasted bread slices. Place the pancetta on one side and the tomatoes on the other, season the tomatoes with salt and pepper. 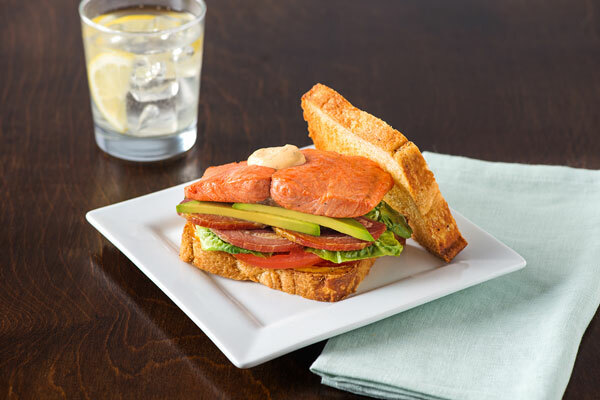 Top the tomatoes with the romaine leaves, add the salmon and avocado and close the sandwich and slice if desired. Combine all ingredients except the oils in a food processor, with the motor running add the oils slowly to emulsify. Correct the seasonings and reserve. This can be made a day or two in advance and stored in the refrigerator.